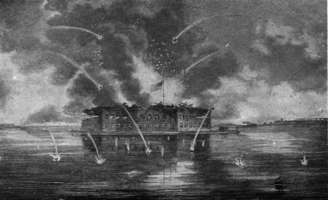 1 Francis Scott Key wrote "The Star Spangled Banner," and he included lines that said "And the rocket's red glare, the bombs bursting in air, gave proof through the night that our flag was still there." Today we celebrate the Fourth of July with brilliant explosions of fireworks. These dazzling balls of fire that light up the sky are incredible blends of colors and patterns...and sounds! 2 There are many kinds of fireworks, and each kind has its own unique sound. One popular type of firecracker is called a bottle rocket. This is a miniature rocket. It zips into the air with a sharp, high sound. After that comes a big pop! A skyrocket firecracker is like a bottle rocket, but this firecracker explodes into colors. It makes louder noises than a bottle rocket. 3 Saturn missiles launch many rockets at one time and create an array of whistling sounds followed by quick pops. Saturn missiles are not for the faint of heart, so have your earplugs ready! If Saturn missiles are too loud for you, a champagne popper might be better. When you pull a string on these small firecrackers, confetti sprays out with a quick pop!